In late January of 2012 I was looking around for ideas to create an epic animated music video on GoAnimate that told a story of a battle against the odds. This came about as a result of re-viewing, yet again, one of my favorite GoAnimations of all time created by GoAnimator, Tripfold, called The Jet Set Concussion (The Blueberry Fiz Contention 2). I've embeded it below. It still stands up as a great GoAnimation even now. It's an old animation (published in October of 2009) that tells a love story of our hero of sorts in the face of aliens hell bent on destroying the world. I like it because of how it tells the story with no dialogue. How it uses music to set the pace of the action and that it features plenty of detail and subtle animation techniques, not really seen on GoAnimate at the time (such as paralax movement of objects to give a feeling of depth). Then there is just the epic-ness of it all. I wanted to do something along those lines so began trawling YouTube for a suitable song. Something that inspired 'epic-ness'. In late 2011 GoAnimate's Chibi Ninja Theme and sword fighting action packs had been released and I'd yet to do anything with them. GoAnimator, Chaostoon, had had a huge success with his Swords and the follow up Swords II animations. Both are excellent but, for me, didn't quite showcase the moves in the sword fighting action packs in the way I wanted to see them. 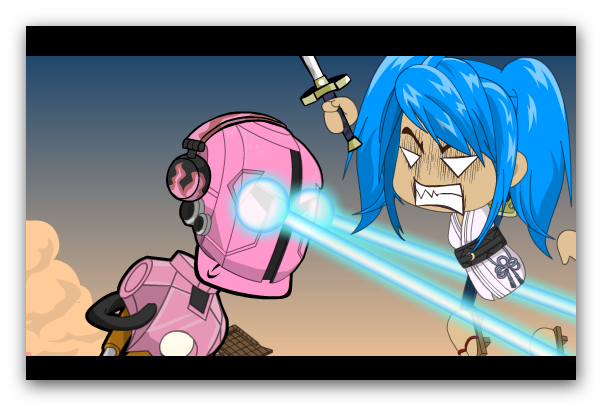 (Though in hind sight, The first Swords actual sword fight is easily better than what I've achieved in my Yoshimi animation - more on that later). I first heard of the band The Flaming Lips when they released one of their most successful singles to date, She Don't use Jelly in 1993. It brought much attention to their quirky, alternative and experimental music. I don't think I've ever bought any of their music but even so, their biggest songs have stuck them in my head as a band that's always done things differently. I was looking for their 1993 hit with a view to perhaps using some of it in my animation (at that point my animation was going to feature more than one song). Whilst searching Youtube I came across their 2002 song, Yoshimi Battles the Pink Robots (Part 1) from the album of the same name. I had heard it before, many years ago, but seeing the title alone again was enough to make me think this is the perfect song for GoAnimate's Chibi Ninja theme. If you read through the comments of the Youtube clip at the link above you soon discover there's some contention as to what the song is about. There's the real world and then there's this fantastical world. This girl, the Yoshimi character, is dying of cancer. And these two guys are battling to come visit her in the hospital. And as one of the boyfriends envisions trying to save the girl, he enters this other dimension where Yoshimi is this Japanese warrior and the pink robots are an incarnation of her disease. It's almost like the disease has to win in order for her soul to survive. Or something like that. I haven't been able to find anywhere online where Wayne Coyne confirms this is also the original story of the song. If you listen to the lyrics the metaphor doesn't quite work in my opinion. Never the less I based my idea for my animated music video of the song on this very concept, though my pink robots simply represent the girls illness, which isn't necessarily cancer. Below is the final result. As you can see the clip makes considerable use of several of the Simple Perspective techniques I recently wrote tutorials about in this blog. It also uses GoAnimate's new scene transitions to cross fade between scenes and the new Enter/Exit feature to fade in and out individual characters. 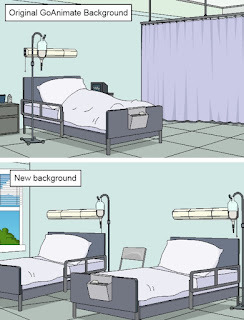 One thing that only GoAnimators, who are really familiar with the Comedy World theme, might notice is the new camera view of the hospital bed background. I created it initially for variation but it came in useful for having the little Yoshimi fly out the window at the end. 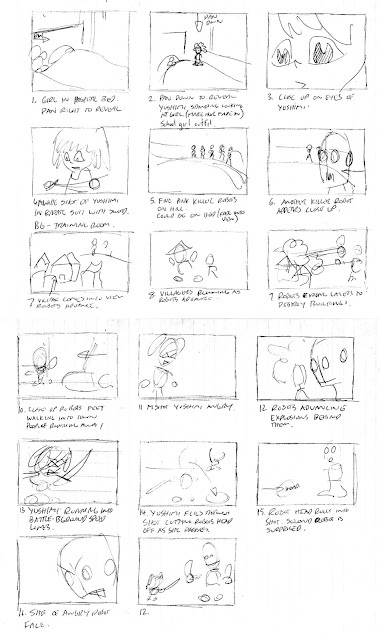 In terms of creating the story, I did actually storyboard about the first minute of this animation because I was having a hard time coming up with ideas directly in the studio - which is how I usually work. You can see my storyboard below which should give you a sense of how rough my storyboards are. 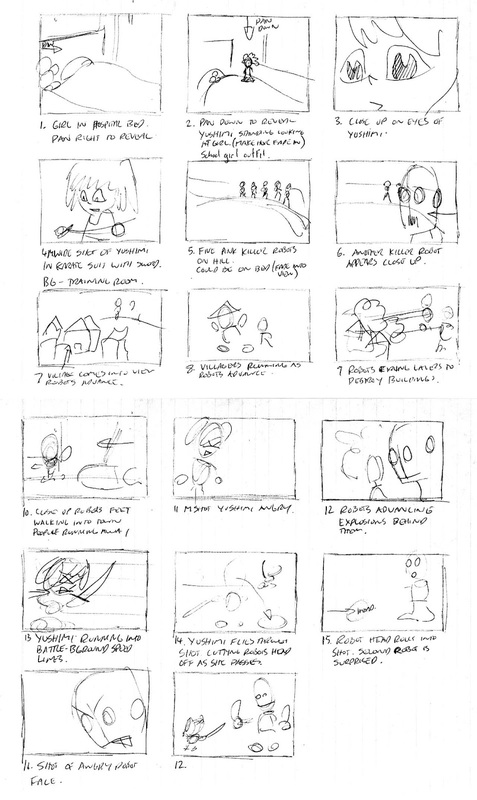 Yoshimi Story board - click to enlarge. 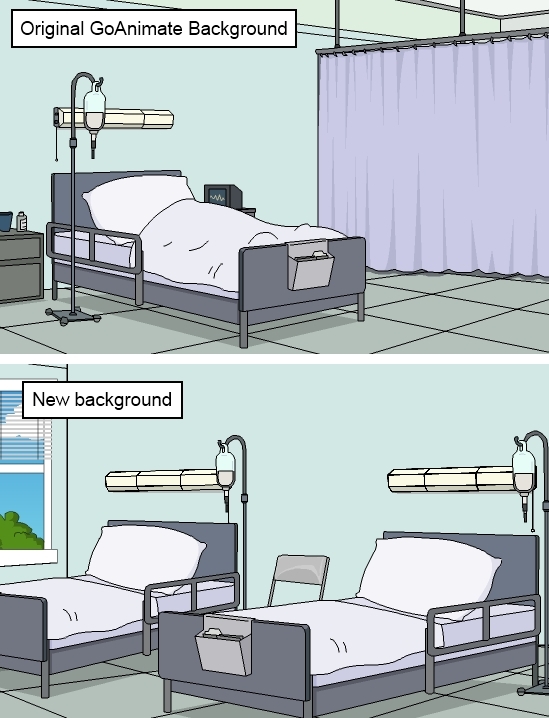 If you look at the first few panels of my storyboard you can see there's no nurse sitting next to the bed. As I put the animation its self together I added the nurse in and made it some-what ambiguous as to whether Yoshimi is the sick girl in the bed or the nurse. The girl's father was also an addition because I needed different things to occur each time we came back to the hospital. I didn't want to keep coming back to a bed with a girl sleeping. As the story evolved it was clear the video needed to end with the girl waking up after Yoshimi successfully destroys all the robots. I like to think I'm really good at animating sword fights but in reality I don't think I"m all that cut out for it. Not with GoAnimate at least. This animation gave me a new appreciation for Chaostoon's Swords animation. The sword fight he choreographed in his first episode is closer to what I was hoping to achieve in Yoshimi than what I did. To be fair on myself, it's not easy to create a sword fight where one character is considerably larger than the other. It makes it even harder to match up the preset attack and defend actions. That aside I was starting to loose patience with getting the moves I wanted to animate looking like they were actually hitting their targets. 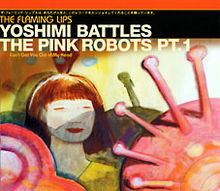 That's why Yoshimi knocks out the first four robots relatively easily and cleans up the last one by throwing her sword. You really do need a lot of patience to do a good fight animation really well. I think I've covered all the main things behind the scenes. It's not quite the epic animation I wanted to make but it's a step closer to doing something nearly as awesome as The Jet Set Concussion.